Athens Photo Tour works with an extensive network of pro photographers helping travellers to hire a photographer in Santorini island, without the hassle. You are booking a local professional photographer with knowledge of scenic spots and best times to visit throughout the season. We have been offering photoshoots in Greece, especially in Santorini for the past five years. Our Santorini Photographers offer photoshoots, surprise proposals, honeymoon photoshoots and more. We host more than 250 photoshoots in Santorini alone, maintaining a five star review rate! Check out our Tripadvisor reviews. We removed the hassle for anyone want to hire a photographer in Santorini. Let’s start talking to organise your Santorini Photoshoot. Santorini is a famous island which is visited by millions every year (more than 2 million travellers visited in 2018, between April to November). It’s one of the most beautiful and unique vacation islands in Greece. Save time and money by hiring a vacation photographer in Santorini to capture those photos that you will cherish for a lifetime. In a nutshell you will want to avoid huge crowds that roam the tourist areas. Let us help you avoid that! If you are looking to hire a photographer in Santorini, for a photo shoot, you have come to the right place! From the whitewashed small houses hanging off the cliffs to the majestic blue dome churches our Santorini photo shoot will take you across the caldera region to the villages of Oia or Imerovigli. If you choose to spend more time with your Santorini photographer (3 or 4 hours) you may visit those iconic traditional small alleys of Pyrgos, Emporio or Megalochori. Already decided? Go on and book your photographer in Santorini for the hours that you need. Ranging from 1 hour to a full day photoshoot there are different itineraries to follow based on time booked. Our Santorini photo shoots are available from early February to late November. Not decided yet? No worries, take a look below! Santorini is probably the only place in Greece enjoying huge tourist growth every year. That being said Greece’s weather is so nice you can visit Santorini nearly all year round. May, June, October and November is the best time of the year to enjoy a vacation in Santorini. Peak summer months July, August and September are the busiest months in Santorini. From December to April you will find moderate weather, little rain and some clouds. It’s definitely a time of the year to visit if you are on a budget or on the lookout for lower prices. These months are the coldest, also. We plan our photo shoots depending the time of year, so you don’t have to mind the small details. Our photographer in Santorini will discuss with you best places and ideal time of the day for the perfect photo shoot. We take all the hassle of you! Maybe the most iconic photos you see from Santorini are from the white washed houses overlooking the Aegean sea. All these blue dome churches found at Oia and Imerovigli would seem very nice as a background to your photos. Or the infamous small anarchy built alleys inside Oia, Fira and Imerovigli where you are literally hanging off the cliffs. All these wonderful sites can be part of our photo shoot. Depending the month you travel we recommend to start early at Oia, either at 08:00 or 09:00 every morning. Want to visit Oia and schedule your photo shoot mid-day or evening (sunset) there during summer? Forget it! Oia is known for the castle sunset spot and every day, especially during summer, thousands of people storm those small alleys to catch a glimpse of the infamous Santorini sunset. If you are travelling to Santorini the winter months (off season) from December to March you can schedule the photo shoot in Oia in the evening. Oia is famous not only for the the sunset views but for the Blue domes church. This church is situated in the caldera region of the village following a path from the main road. It’s easily accessible and as you can imagine pretty famous. People line up to take photos with the Blue domes as a background and usually people are friendly waiting in line for each other photos. So especially during the months from June to September Oia gets a large number of visitors from 10:00 to 17:00 every day. From that time till sunset regular visitors and tourists of Santorini drive to the northern village of Oia to view the sunset. So literally all day, Oia is packed with tourists. This is why we recommend Oia photo shoots to be scheduled early in the morning. Is Imerovigli village equally beautiful? Imerovigli village on the other is easily accessible and equally beautiful. You will love the small alleys as the high cliffs give way to majestic views of the sea. Views that only Santorini has to offer. It is situated north of Fira (main island city) on the road to Oia. Imerovigli overlooks Skaros rock, which are the remains of a Venetian Castle. There is a walkable path from Imerovigli to Skaros where you can visit the small Chapel of Panagia Theoskepasti (not seen from Imerovigli). For some people the sunset from Imerovigli is even more beautiful than Oia, especially during the summer months. Imerovigli is visited by tourists all day but people are less than what you will find at Oia. We definitely recommend to schedule your photo shoot at Imerovigli in the evening. Choose Imerovigli for the wonderful panoramic caldera views, the white washed houses that are to be found everywhere. This is why we recommend Imerovigli either for morning or evening photo shoots. Imerovigli is also high on the list of people wanting to propose. We offer two surprise proposal packages in Santorini. You can book a Santorini Photographer for a surprise proposal and a photoshoot in one day or split the surprise proposal and photoshoot in two days. That way you can let her get ready for the photoshoot the day after the surprise proposal! Santorini is famous for some iconic traditional Greek Aegean architecture villages. Situated in the center of the island, Pyrgos village is built in high ground, overlooking Fira. Along with Emporio and Megalochori villages, these three can be an excellent background to your images. Wonder around the small alleys, colourful doorways and friendly people leaving back the noisy and full of people more touristy places of the island. Complete your visit to Santorini by adding some time to your photo shoot and have your personal photographer with you in Pyrgos or Megalochori or Emporio. What to wear? Can i change outfits? Well, try to imagine Santorini, if you haven’t visited before. What is the first thing that pops into your mind? White washed houses, blue sky. Anything that will make you pop from the background (colourful) is usually flattering. Want to go same colour palette? White and blue is awesome and you will be in style with the Aegean islands colours. As this is a walking photoshoot from location to location, flats or easy to walk shoes are essential You can bring your beloved high heels and change every time we start taking photos. You are most welcome to bring a change of outfits, or two! We have plenty of time and you will be able to change outfits along the way. Glad you asked! We have segmented time based on which places you want to visit during your stay in Santorini. 2 hours, 4 hours or a full day. Read why we don’t recommend the one (1) hour photo shoot, but we still offer it! Two hours Santorini Photo Shoot. Choose between Oia (morning) or Imerovigli (morning or evening). You will have plenty of time to take the best photos in each location. You will meet your photographer on site and walk between each location. Four hours Santorini Photo Shoot. Choose between Oia and Imerovigli for a maximum of caldera, high cliffs, and best views of the sea. Our photographer will pick you up from your hotel and together you will enjoy a more relaxed photo shoot. As always a personal orientation of the island is included with all our photo shoots. You can also mix choices by choosing to visit Oia and Pyrgos, or Imerovigli and Pyrgos to get the magnificent caldera views with the interesting traditional architecture of Pyrgos village. Full Day Santorini Photo Shoot. An eight hours photo shoot extravaganza! Together with your photographer you will visit Oia, Imerovigli, Pyrgos and Emporio or Megalochori to stage the perfect photos from your trip in Santorini. An once in a lifetime experience to have visited and have photos from the most picturesque places in the island of Santorini. Hotel pick-up and drop-off is included at no extra cost. One hour photo shoot. Though we currently not recommend it, we understand that people might have minimum time for this shoot. Choose between Oia or Imerovgli and book your photographer in Santorini, here. How many people can i book? All our Santorini photoshoots are time based. If you book for more than 4 people, consider booking the two hours photoshoot package in order to have adequate time for all. For groups of 10 people and more, consider booking at least three hours. We need enough time to walk between spots especially if you have a list of favorite photos to be taken. Santorini is well known between couples that want to spend some intimate time on their honeymoon. A romantic and relaxing getaway from busy life. One will want to propose to his girlfriend in Santorini, it will be the perfect plan! Santorini is also the number one Greek island in destination weddings every year! Pre wedding or Engagement. Flying to Santorini for your pre-wedding? 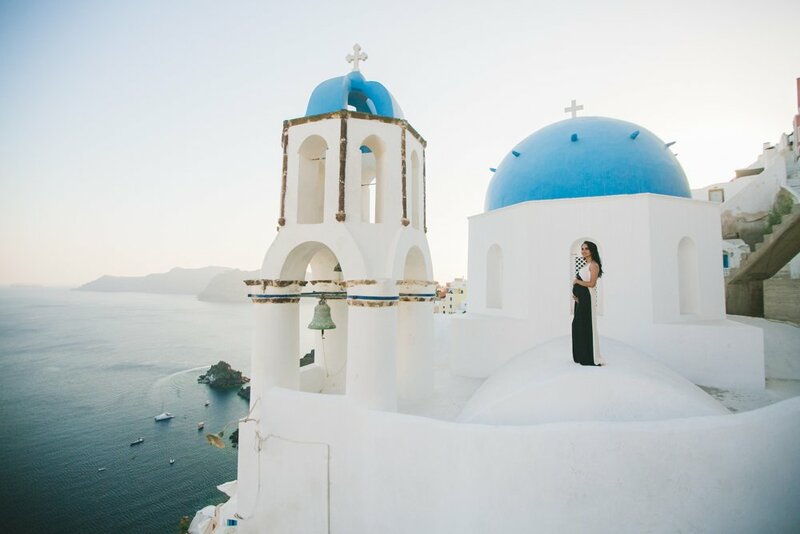 Do you dream on going back with an amazing set of engagement photos from Santorini? You will need at least two to four hours scheduled for an engagement shoot. Pre wedding photo shoots in Santorini are very common. You will want to show some diverse scenery so book a photo shoot with caldera views (Oia, Imerovigli) and Pyrgos village full of traditional alleys and colors. Hire a photographer in Santorini for at least four hours or a full day. Surprise Proposal. Every year we work with so many people organising and setting up the perfect surprise proposals in Santorini. 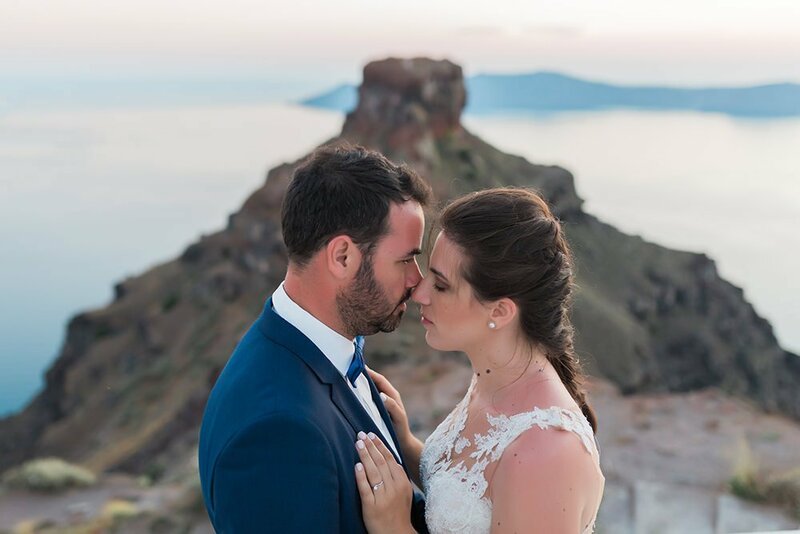 Santorini has some of the most excellent views in Greece, no wonder a surprise proposal in Santorini would be the perfect start for your marriage. Finding the perfect spot, organising the perfect time is a lot, let us help you. We can also recommend a nice restaurant to end the day with style! We started offering a second option which includes an evening surprise proposal with a 30 mins photoshoot plus an hour of photoshoot in a different place the next day, usually morning. Honeymoon couples. Santorini is a top worldwide destination for couples on their honeymoon. Every year besides a big number of weddings, thousands of couples choose Santorini and the Aegean islands for their honeymoon. You would want to decide on the time of the day that you are going to have your photo shoot, see above for choosing time and place. Some couples want to bring their wedding dress and groom suit and have like a next day destination photo shoot to compliment their wedding. We recommend choosing two or four hours for all honeymoon couples wanting to hire a photographer in Santorini. Weddings or Elopements. This is a different type of photo shoot, which needs a lot of planning before the actual day. You will want to set time for our photographer to capture your getting ready sessions, the wedding ceremony and formals of the bride & groom and the wedding party. Also you might need to allocate an hour of photography before getting to the wedding reception for a complimentary photo shoot of the wedding couple. We usually offer wedding or elopement photography packages than span from four to eight hours. For a complete portfolio of our wedding – elopement work have a look at Dimitris Giouvris Photography. Like what you see? Let’s get in touch so we can talk about your wedding. Families photo shoots. Though much of the villages are accessible only by walking, this might make it a little strenuous for families with small children. You definitely need to do it, maybe choosing one hour of photo shoot and a place which is easily accessible in the island. It’s always better to book as early as possible. This will give you enough time to plan, visualize and organize your photo shoot with your photographer. Especially if you are planning to be in Santorini during the high season months between June, July, August and September. What about last minute bookings? Though we cannot guarantee availability on a last minute booking, let us know if you are interested and we will try our best to accommodate your needs. It will be super helpful if you have two or three days of availability during your stay. What does it cost to hire a photographer in Santorini? Check out the Santorini Photo Shoot page to see prices. Choose your desired time and start talking with your photographer to plan the best time and place. Our most booked plan is the 2 hours photoshoot, with a cost of 249 euros for 100 images. People that want to visit Oia and Imerovigli choose to book the 3 or 4 hours photoshoot. Have a custom plan in mind, contact us for any questions. Absolutely YES! Santorini is a Greek island and many tourists visit the island all year long. Even if Greece is amidst of an economy crisis you will have trouble seeing that in Santorini. People are super friendly, like everywhere in Greece. You will have no problem wondering towns, alleys either day or night. Even for solo (women) travellers this is probably a super safe destination. The biggest problem is traffic accidents, as Santorini’s roads are small and narrow while been used from all imaginable vehicles. Atv’s, scooters, motor-bikes, cars and buses share the small roads so it’s bound to have accidents. Don’t drink and drive and certainly don’t drive fast and you will be alright. Santorini public bus service offers an extensive schedule, check out their timetable. Having said that, it’s always nice to exercise common sense and precautions everywhere you travel, Santorini as well. Already decided? Great, let’s connect and start talking about your photo shoot in Santorini.